Which one if for homes, which one for industry? As for IEC 60898-1, it relates to the a.c. low-voltage circuit breakers – MCBs – we find in our homes, schools, shops, and offices electrical distribution switchboards. The standard states that the top rated current is 125A, while the lowest is 6A and maximum value of rated short-circuit capacity (Icn) is 25kA. Just those basic tech specs tell us how different the use of circuit breakers defined by our two standards are. Yes. The rated voltage currently required in industrial-use CBs is 440, 690 volts or higher. Compare those numbers to the 400V upper limit between phases for residential MCBs. Reference ambient temperatures are 30°C for households. The same goes for impulse withstand voltage (Uimp). IEC 60898-1 requires 4kV, in line with the use for final circuits. Whereas for industrial circuit-breakers, usual values of Uimp is 6 or 8kV, in line with the position of the circuit-breaker, at the origin of the installation. Who confuses the two standards and how? The history of standard IEC 60947 may have something to do with it. The concept behind it as it evolved in 1970s-80s was a single standard for all low-voltage switchgear. That notion, combined with lack of knowledge or technical expertise, may have led to the misconception that there is one standard for all CBs. Of course, it wouldn’t matter so much if people thought it was IEC 60947-2. Or take the tripping characteristics: IEC 60898-1 clearly describes B, C and D curves with ratio to rated current, while in IEC 60947 2 the instantaneous tripping release may be adjustable according to the need of the user or pre-defined my manufacturer with ±20% tolerance. This is the reason why manufacturers in addition provide a wide scope of different curves: K, Z, MA. Typically IEC 60898-1 certified CBs meet minimally required performance to proof proper protection of household installations: Pollution degree 2, impulse voltage 4kV, isolation voltage is the same as nominal voltage 400V. That is the reason why usually we meet limited number of printed technical information on CBs. These CBs are intended for use of indoor, pollution and humidity-free conditions: household or similar installations overcurrent protection by uninstructed people and not being maintained. In other words – in final distribution electrical switchboards of buildings which nominal current does not exceed 125A. Usually these circuit breakers sold by electrical retailers: simple to install, safe and easy to use even after many years without maintenance. The most suitable solution for use are MCBs certified with both standards as their performance meets requirements of use for residential installations and high enough for use in industry and infrastructure applications. Due to high level of protection performances these CBs should be used at least in incoming electrical switchboards of buildings applications. I can say is that mix-ups of standards happen. The best way to avert them is tightly worded, highly enforced national regulations. And for prescribers to specify what CBs will be used for and then to check the standard for that use. Have you ever mixed up the two standards? Leave us your comments below! I am from India. And I did engineering from electronics and communication in 2010. At present I am in search of job can you help me in getting job so that i can creat my future. ..
@Praseet > Thank you for your interest in our company. You can view our current job opportunities, apply online or send a spontaneous application here: http://www2.schneider-electric.com/corporate/en/careers/jobs-with-us/jobs-with-us.page? Good luck for your job search! I am confused with two standards for the same breaker. Does it mean that the trip kA is different when the breaker is used for residential or non residential use? ICU and ICN. Also as i am new, how do i calculate my trip current ? Assuming the breaker is a 3 phase 230VAC, 63A. I have never confused them yet maybe because its not much since I started working.Anyways the information was very useful and I’m sure I will need it in future. Good for making Technical specification for electrical tender. INDEED , THERE WILL BE CONFUSION HERE AS MORE OFTEN THAN NOT THE IEC-60947 IS USED COMMONLY IN SPECIFYING LV SWITCHGEAR DESIGN AND IT’S COMPONENTS WHILE THE IEC-60898 IS NOT COMMONLY USED. THIS MUST BE HIGHLITED EVEN MORE BY IEC COMMITTEE TO AVOID ERROR. I have started working in the industrial sector and am having trouble completing test certs for installations fed from panels. How do I go about working out Max Zs Values for CB’s that have so many variables. The NICEIC just say refer to manufacturer, but I cant find the information for 60947-3 mcb’s starting from 2A and also for a lot of the motor starters GV2,3 etc etc. Can anyone help? Stephen, the Max Zs value is not always published in technical guides. You should contact the technical support of Schneider Electric in your country. Can these breakers be used with an inductive load? Dear Max, you should verify the inrush current of the inductive load first. Usually it is recommended to use D, K or MA curves MCB’s to protect inductive loads. Typically: C curve: Ii=5 to 10 In, D curve: Ii=10 to 14 In. Shall any where mention on BS or IEC that we need to do Field Trip Test for each MCB’s type B,C,D .We are using SCHNEIDER MCB,s and the project is for housing. How to verify MCB functioning well on site? I work for the utility in South Africa and am researching the use of MCB’s at the PUC between the utility and an IPP. Are AC MCB’s able to be used for DC applications? If so, What is it about the Ac rated MCB’s that makes this possible? Yes the standard AC MCBs can be used on DC applications. Thanks so much for the reply – very useful info. Are AC MCB’s polarity sensitive? My thinking is that by nature AC signals reverse polarity each cycle and therefore it would not matter which way the MCB was wired. Ricki, you are correct, there are no difference on MCB’s power supply side connection in AC applications. to answer to ricki comment to use of MCB in DC current. I want to ask you that. can we use all AC MCB in DC voltage? free of voltage,current or curve. and that link is unavailable too. DC breaking conditions are different than AC. In order to use AC breaker in DC applications you should follow manufacturer recommendations. If such recommendations do not exist – its better to use dedicated DC offer. I mean Schneider MCB’s. 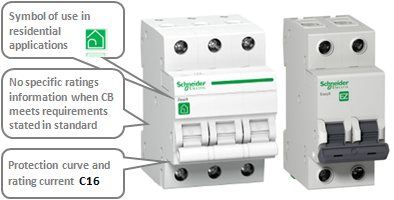 can you help me more about use of Schneider MCB in DC current. pleas send me by email. 2) According to these standards any manufacturers could provide life time warranty. Aging of Plastic covers, degradation of Bi-metals / Springs & No calibration for a long time as if it a life time product. As mentioned in the blog, MCB manufactured as per IEC 60898 to be used in residential buildings or similar applications. In industrial applications can be used breakers certified as per IEC 60947-2 or IEC 60947-2 and 60898 both. Test procedures are explained in the mentioned standards. You can download them from official standardization bureau sites. What is the difference between short circuit values mentioned in the 2 standards , Icn values in IEC60898 & Icu value in IEC60947. There is also one observation that Icu values of MCB’s as per IEC60947 are higher than Icn values of MCB as per IEC60898. If I understood your question well, the difference comes from ratio of nominal Icn and ultimate Icu breaking capacities ratio to service breaking capacity Ics. It is usually stated in percentage 100%, 75%, 50% or less. As higher this value as more “robust” breaker to withstand Ics. Unfortunately I have no answer for the question. I would recommend to find the answer by contacting technical support team in the country. 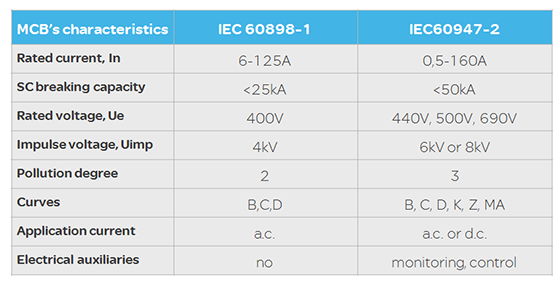 MCCB standard is IEC60947 and MCB is coming under IEC 947 & 898. So what is your opinion of using MCCB-947 & MCB-898 in a single distribution for a residential/commercial buildings. Also any problem occurs if using IEC898 MCB in industrial applications. Dear Sahad, it is normal having MCCB certified as per 947 in commercial/small commercial buildings with MCB’s certified as per 898. And it is wrong to use MCB’s dedicated for domestic applications (60898) in industrial applications installations. In any case you should pay attention on technical characteristics of devices like: Icu, Ics, Ue, Uimp, pollution degree, ect. We use Siemens breakers and they have a SCCR rating of 10KA as per IEC 60898. Under IEC 60947 they do not mention any SCCR rating . But somewhere on the breaker it says Icu 20 KA . All in all there are so many interrupting ratings that I am so confused. All I need to know is are 5SY4232 breakers 10 KA rated for industrial AC application. Do you have DP breakers IEC certified for industrial application and 10 KA rated? 1) In the product catalog you can find that range 5SY4 is only certified per EN60898-1 and EN60947-2. Unfortunately I found no value for Icu there. It has Icn=10kA only. I do not have example of the breaker to comment this point. Icu is given only for range 5SY8. When I use MCB iC60N which breaking capacity I should refer to? You should keep it simple: residential installations – IEC60898-1, industry and commercial buildings – IEC60947-2 & – IEC60898-1. In your given example its not exactly as you name it: for iC60N range the 50kA Icu is only for breakers in range of 0,5-4A, for the rest of the range it is 10kA. As you can see, breaker performs 7,5kA service capacity which is applicable for both standards requirements to declare. IEC60947-2 used by MCCBs and IEC60898-1 are used by MCBs, is that correct? Can we consider iC60 a MCCB if the application is based on IEC60947-2? No, your statement is not correct. MCB is a miniature circuit breaker and MCCB is a molded case circuit breaker. Difference is in the breaking technology and size. Hello Vlad, our customer need 10kAIC circuit breaker for Lighting / C.O. loads. Is it safe to offer the iC60n where it is 20kAIC at 230Vac,2P @ 947-2 standard and 6kAIC @ 898-1 standard? What is the right thing to say if they questioned us why we offered 6kAIC breaker? Yes it is safe choice. iC60N 2P @230Vac during the trip has a double break effect (circuit is interrupting in 2 places, per each pole). It means at Isc=10kA 2P breaker is much reliable and can withstand up to Icu=20kA than 1P or 1P+N breakers (Icu=10kA). Dear Mostafa, in IEC 898-1 it is mainly used definition of Icn (rated (nominal) breaking capacity) but not Icu (ultimate breaking capacity) and it makes the difference. In DC MCBs, what’s the multiple between Ii & Ie? Why marking on the the MCB are only based on a IEC 60898 standard And specification of MCB according to IEC 946-2 can be seen only in the data sheet? If the field of installation is commercial buildings or industry, Icu=10kA is proper solution. MCB IEC 898-1 :10KA, IEC60947-2:15KA. Why is IEC60947-2 is higher at 15KA. 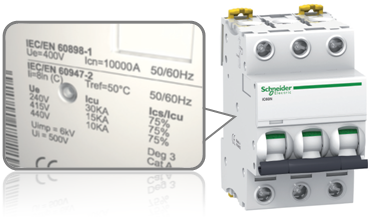 If i need a MCB IEC60898-1: 15KA, is there such product from Schneider? It is higher because of lower Icu breaking capacity ratio to service breaking capacity Ics, eg. 75% instead of 100%. In any case it will break 15kA. If you need 15kA according 60898-1, please check with local offer available, typically it is range of C120. Thanks for your reply. One more question regarding RCCB. The printed label on RCCB is either 6000A or 10000A. Understand that is making capacity and not Short Circuit capacity. What this 6000A or 10000A meaning. If my outgoing MCB is 10KA, them I should use a 10000A RCCB. Is this correct? I would like to know what have been the design and technological trend in low and medium current and high current miniature circuit breakers. I would really appreciate any help provided. We have MCCB NSX 250H with Micrologic 2.2 trip unit installed in our utility station. We would like to connect 440V HPU with star-delta starter, inrush/peak start up current is abt. 448A, FLA is abt. 198A (HPU motor has it’s own overload protection). Is this breaker fit for purpose along with Micrologic 2.2 trip unit? What will be be approximate short-time delay timing for 448A inrush? Thank you for the useful infprmation.